The handful of Movement of Parking Meters (MAPM) supporters on Regent Street opposite City Hall on Thursday, April 19, 2018. The reintroduction of metered parking in Georgetown is unlikely to get central government’s approval when Local Government Minister, Ronald Bulkan considers the revised contract between City Hall and Smart City Solutions along with bylaws to govern paid parking. 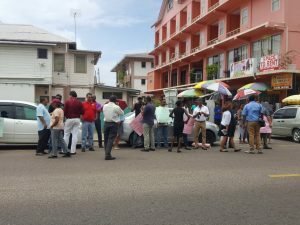 Bulkan told Demerara Waves Online News in an exclusive interview that he would have to examine the contract first before he could decide whether to ink the by-laws that were approved by a simple majority of councillors on April 4, 2018. The 14-day period for the public to file objections with the Town Clerk expired on Wednesday, April 18, 2018. However, the Local Government Minister said he was yet to receive copies of the revised contract and council-approved parking meter by-laws. Bulkan, however, stopped short of saying that he would approve the by-laws and pave the way for metered parking to return. “I will get a copy of the revised contract and then it will be examined to see if we can lend support to it but I can’t prejudge the matter….We will have to examine the merits of it and see if we can give our support,” he told Demerara Waves Online News. Asked if, based on criticism about the City Hall-Smart City Solutions contract, he was likely to give the green-light for metered parking, Bulkan virtually ruled out the resumption of paid parking in several wards across Georgetown. “It doesn’t look too good but I can’t prejudge anything,” he said. Central government had several months ago suspended the by-laws and had ordered a review by the Ministry of Finance and the Attorney General’s Chambers, after weeks of public outcry. Meanwhile, the Movement Against Parking Meters (MAPM) Thursday afternoon attracted just a handful of mainly organisers for a one-hour picketing demonstration outside City Hall on Regent Street. Marcel Gaskin reiterated that the contract between City Hall and Smart City Solutions was illegal because it allegedly breached procurement rules because there was no public tendering or feasibility study, but justified his decision to submit objections to the parking meter bylaws. He said he was legally entitled to submit objections and that he believed that the bylaws were not confined to the contract with Smart City Solutions. MAPM said it resumed its weekly midday protest to continue the pressure on government and City Hall to scrap the metered parking contract while awaiting a High Court decision on the legality of the contract. “Numbers have dwindled but the effort is still there. We are by no means giving up. We will not give up until the court says the contract is illegal. Until then, we will be out here protesting against the parking meters. The contract, as far as we are concern, was born in illegality and it’s up to the court to put the final nail in the coffin to say ‘yes’ it is illegal,” Jonathan Yearwood said. Yearwood urged City Hall to await the High Court decision, instead of trying to force metered parking at GY$150 per hour with the aim of increasing the rate to GY$500 per hour after a review in another six months.